A pretty cool western movie, that is far from anything great, but definitely some B movie fun. A Sam Raimi movie all the way, this is the B movie version of a western. Think of it as if Tarantino made a movie all about shootouts and a tournament in a small town. The usual cliches are there, including a corrupt and overbearing sheriff, and a mysterious stranger who rides into town. It’s not the story that makes this movie anything special. It’s the characters and style. From camera work to pacing to set design, this film works on all kinds of levels. Raimi is a director who spices his movies up with shocking moments and vicious humor. These elements punctuate this film. It might not be the smartest movie out there, but it’s definitely campy, entertaining, and a whole lot of fun. Sam Raimi is the king of B movies. There’s only one director that does this genre better and that’s Quentin Tarantino. Only with Taranatino, he takes B movie material and makes it look like A movies. He actually makes some of the best movies of each year. With Raimi, the movies might not be the best, but they are certainly contenders for the most fun. Raimi is a director who is all about the camera tricks and sleight of hand manipulation. Like Tarantino, he loves to shock the viewer with sudden grotesque imagery, such as exploding or torn off body parts. Both of these guys go more for fun, campy movies than they do for realistic dramas. They are the two masters of the genre, and Raimi has put his sense of style and spirit into every one of his films, (other than the Tobey Maguire Spider Man movies, which were more studio oriented, PG-13 fare.) But with everything else he’s done, from The Evil Dead 2 to Drag Me To Hell to Darkman, this guy shows how much he loves to entertain, surprise, and keep the audience thrilled. 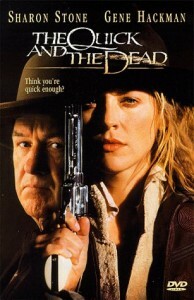 The Quick and The Dead is a movie that could be subtitled, Sam Raimi makes a western. It’s always fun when directors do this for just one film, taking a single crack at the genre. Like when James Mangold tried it with 3:10 To Yuma. With Raimi, he brings the same level of R rated energy to the project that he brings to just about all of his films. The story isn’t great, and you can hardly expect it to be. When was the story of a Sam Raimi film ever great? What does work is the pacing, characters, camera work, and humorous tone. This movie is about a town that holds a shootout competition every year. We’ve seen these standoffs in western films before, where both characters walk out into the street and face each other, neither one of them drawing his pistol yet, but just waiting for the right moment, and hoping to be the one to draw first… It’s actually a staple of the genre. But this movie might be the first and only film to be all about that. You would think that a movie that examines a cliche that we’ve already seen a thousand times before, might be a little dull. Not with this filmmaker running the show. Raimi makes it into a tournament film, complete with brackets on a big chalk board and everything. He pumps life into every scene and creates an atmosphere that we want to be in. The actors at play here are Sharon Stone, Gene Hackman, Russell Crowe, Leonardo DiCaprio, Keith David, and Lance Henrickson. There are some others too, but those are the ones who make up the all-star cast. 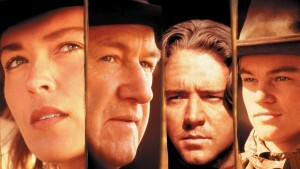 Stone is the protagonist, and that’s a rarity for a western, to have a female lead. Especially a female gunfighter. And she doesn’t even get romantically involved with anyone. This movie is treating the Sharon Stone character, Ellen, exactly the way it would treat a man in the film. At least once the storyline gets going. When she first walks into a bar, a stranger in a new town, the man running the place, (Pat Hingle,) mistakes her for a prostitute and tells her to go to the brothel next door. She quickly puts him in his place. Gene Hackman is playing the baddie of the film, named Herod, and he’s basically reprising his role from Unforgiven, just a few year earlier. Herod is the sheriff who makes the townsfolk pay him taxes and is hated by all who live under his rule. He has a group of enforcers who travel with him, and he takes and does whatever he pleases. Both Herod and Ellen are cliched characters, and the movie makes no attempt to hide that. She’s playing the mysterious stranger that Clint Eastwood perfected in this genre so well, between his Man With No Name trilogy and his movie Pale Rider. Hackman, as the larger than life, corrupt sheriff, is another cliche or staple of the genre, depending on which way you look at it. Raimi and the film are totally fine with this, and in fact, it is all very intentional. It’s the areas where he can push the boundarys and spice up the genre in ways we haven’t seen before, that make the movie so entertaining. Herod’s house, for example, isn’t just a large, exquisite house, but is more like a Disneyland ride. This thing is so decorated on the outside, that it sticks out in the town, and reminds me of the kind of thing Tim Burton would do with the design and architechture of buildings. Herod sits on the porch of his house, overlooking the entire town, as he smokes a thinly rolled cigar. Aside from his house, the town is also characterized by a giant clock tower and a well. Like Burton always does, Raimi carefully orchestrates the set design here to create the kind of mood and atmosphere he wants. The story might be the weakest part of the film. Now, that’s not to say that it’s lousy or anything, but just very much the usual kind of thing, compared to everything else which is unique to this filmmaker’s style. The storyline is simply about a stranger who comes to town with the intention of killing someone. It turns out someone in this town has wronged her in the past. We get flashbacks to show us what happened, interspersed throughout the film. Of course, it’s the big baddie who she is after. Of course her fight against him will be last. And before any of that happens, the two of them have to work their way through every other gunfighter in the tournament. The camerawork in this movie is like a character onto itself. This is apparent from very early in the film when a man rides into town dressed in a prisoner’s outfit, walks into a bar, and we, the audience, stay outside. Another man comes flying out of the bar, thrown backwards and landing in the street. He runs to his horse, gets on, and rides off. The first man now comes out, grabs his gun and the camera pans to show the man riding away in the distance. The first man fires and knocks him off his horse. All of this is done in one shot. That means there are no cuts and the camera never leaves the position its in since the man came riding into town. Instead of cutting, the camera represents our point of view, and turns to show us what’s happening on different parts of the screen. It gives us the idea that all of this is really happening. That the man who just rode off of the screen is still riding out there, and when we turn to look in that direction a minute later, we will still see him in the distance. All of this looks and feels fantastic. Raimi is a man of flair and style. When it comes to deciding on a gun, we get a scene where Herod brings in the Preacher (Russell Crowe,) who is being forced to participate in a gunfight. DiCaprio is the man (well, at that time, boy,) behind the counter, and he shows us guns and their parts in closeup, explaining them in detail. The funny thing is that The Preacher can not afford any of these and ends up taking the cheapest, lousiest gun in the store. Yet Raimi still spends time showing us all of the other guns, despite it’s irrelevance to the story. There’s a reason for this. Because it’s fun. And it adds to the humor when at the end of the scene, The Preacher doesn’t go with any of them. It also helps establish something that does come into play in the story, which is that The Preacher is only permitted to have one bullet for his junky gun. If God is on his side, Herod says, then one bullet should be enough. For all the good in this movie, occasionally there are areas that don’t quite hit the mark. Sometimes slow motion shots are used for no reason whatsoever, other than that they look cool. A man drops a glass of beer from his hand, for example, simply because a shootout match is about to begin. It’s really just to show us the glass falling in slow motion. Ellen has to act afraid of Herod and even cry about it. She has to act feminine. This happens twice. The first time is following a dinner at Herod’s house and the second one comes when she meets an old man in a graveyard. These are some of the weakest scenes in the film. Some things that happen in the final act might be predictable, but they don’t really take away from the story. They also barely slow down the momentum. This film features some great western music and a smooth and quick pace. It’s a good, fun movie and a nice entry in the genre.